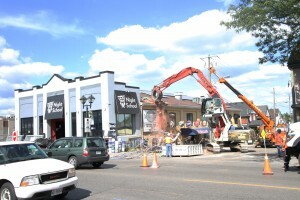 Princess St. between King and Regina was shut down and construction crews were evacuated Thursday afternoon after it was discovered that the building at 56 King St. North — which houses McMullan’s, Night School, The Thief and the Idiot and Loop Clothing — was at risk of collapsing. McMullan’s was undergoing construction to remove the chimney and stabilize the building from prior damage Thursday morning, but while doing so crews discovered that the wall facing Princess St. was swaying. As a result, crews vacated the site and had to use heavy machinery to remove the scaffolding they had put earlier and to demolish the chimney. “They immediately stopped everything, got out of there as soon as possible. Rather than dissembling it piece by piece, they decided to demolish it,” explained Chuck McMullan, the owner of McMullan’s, adding that there is a potential concern of the wall collapsing. “There is that concern … but how much of concern, I don’t know. They do need to shore [the wall] up,” he said. Back in July, a string of intense storms hit Waterloo Region, which caused some considerable damage around the region — one of victims being the roof of 56 King. It was discovered at the beginning of August that roof trusses were broken throughout the building. In terms of internal damages, Night School has suffered the worse, McMullan said. “Almost all the damage and evidence is restricted to the Night School space,” he said, adding that the chimney removal is the only planned task for Thursday. The cost of the damages is still unknown, but according to McMullan, if they have to demolish the whole building the losses could be the millions. “If you had to knock down the entire building, you’re probably looking at somewhere in vicinity of a $2 to $3 million loss,” he explained. But if they don’t, there is no word on when McMullan’s and the other establishments at 56 King will reopen. “From day-to-day that idea changes. Originally it was two months, then it was eight months, then it was two weeks, and now I don’t know,” McMullan explained.